At nearly double the Koons record, the price tag is punchy. But Alex Rotter, Christie’s co-chairman of post-war and contemporary art department, thinks it warranted, as the painting combines the artist’s most recognised themes: “the glittering abstraction of the pool, and the emotional complexity of the double portrait." Surprisingly, given the estimate, the painting is not guaranteed—as yet. Hockney’s double portraits and pool paintings rarely come to auction, as the majority already reside in museums. And, depicting a swimmer watched by a standing figure—Hockney’s teenage muse, Peter Schlesinger—Portrait of an Artist (Pool with Two Figures) is both. Cinephiles might recall it was the cover image of the 1974 cult film, A Bigger Splash, which chronicled Hockney’s five-year love affair with Schlesinger. More recently, it was included in the expansive travelling retrospective that closed at New York’s Metropolitan Museum of Art earlier this year. Rotter says that Hockney's institutional and market visibility over the past few years proves he is finally being “properly canonised” on a broader scale. This particular painting, however, has passed through the hands of just a few private collectors including David Geffen, co-founder of DreamWorks Studios. The Christie’s sale will be its auction debut. The secondary market for Hockney's work has been on the rise for several years. According to Artnet’s price database, the artist’s total auction sales were $43.3m last year, which is up from $35m in 2016. 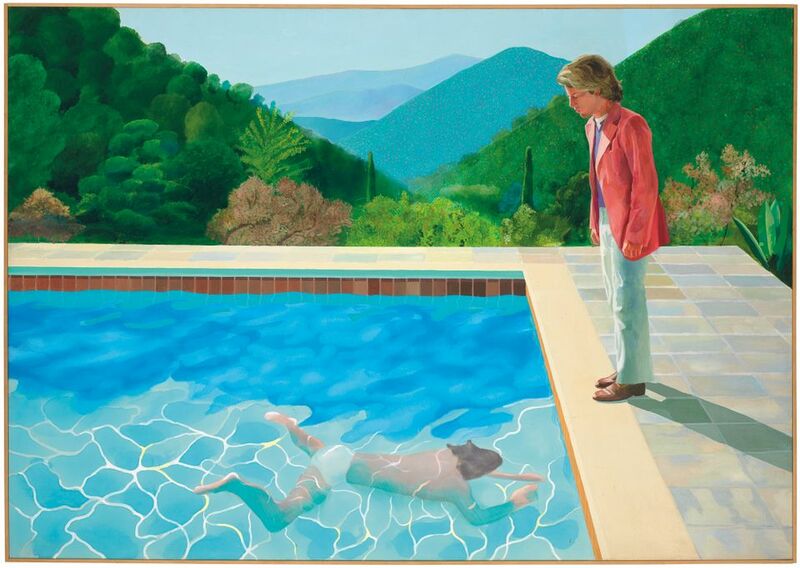 In May this year, the auction record for Hockney was surpassed twice within the space of an hour at Sotheby's New York—first, Piscine de Medianoche (Paper Pool 30) (1978) sold for $11.7m (with fees), quickly beaten by Pacific Coast Highway and Santa Monica (1990) which went for $28.4m. Yet Christie's estimate for Portrait of an Artist (Pool with Two Figures) is nearly triple that. The painting will be exhibited at Christie’s in Hong Kong, London and Los Angeles before being sold in New York on 15 November.